Avail of discounted rate to 2018 Consumer-driven Supply Chain Summit! 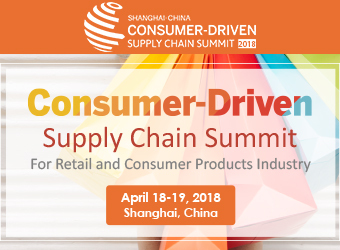 In collaboration with Global SCM, GFA members will get a special rate to their 2018 Consumer-driven Supply Chain Summit on April 18-19 in Shanghai, China. GFA will also give a talk on "Green Freight as a Competitive Differentiator" which will touch on how green freight can help companies establish a competitive advantage with the rise of ethical consumers and also on the benefits of voluntary green freight certification - an added external assurance for companies - that consumers can recognize and trust. The 2018 Consumer-driven Supply Chain Summit provides retail supply chain leaders with deep industry experience, practical insight, best practical, lesson learned and leading trends, which help companies keep pace with change in today’s retail and consumer goods industry, enable you to network and converse with like-minded peers. Retail and consumer goods supply chains are being driven by consumer demands more than ever, global experts will discuss key ways to make your supply chain consistently serve your customers effectively and efficiently. Topics will include digital, multi-channel fulfillment and innovation collaboration, sourcing and supplier strategy, new technology and trends, industry outlook. The CDSC 2018 is the Great Gathering of Global Senior-Level Retail/Consumer Goods Supply Chain Professionals that will fundamentally reshape the supply chain industry over the next ten years. See the full speaker list, agenda highlights and ways to get involved in the conference brochure here. Older PostTake part in a complimentary workshop on carbon accounting!